One of Franklin's first recorded observations of weather patterns occurred in October of 1743, when he planned to observe an eclipse of the moon. As Franklin prepared to watch the eclipse in Philadelphia, a storm moved in and clouds obscured the moon. Later he learned that people in Boston, hundreds of miles northeast of Philadelphia, were able to see the eclipse because the storm didn't arrive there until several hours after the eclipse. Franklin became intrigued and continued gathering observations and eventually determined the direction of movement for storms. He was the first to observe that storms can move in an opposite direction from the direction of the wind. On October 21, 1743, according to popular myth, a storm moving from the southwest denied Franklin the opportunity of witnessing a lunar eclipse. 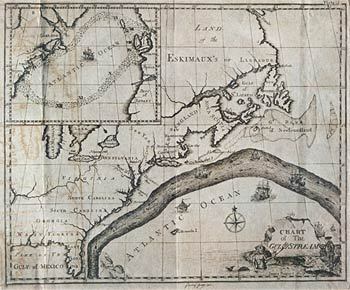 Franklin was said to have noted that the prevailing winds were actually from the northeast, contrary to what he had expected. In correspondence with his brother, Franklin learned that the same storm had not reached Boston until after the eclipse, despite the fact that Boston is to the northeast of Philadelphia. He deduced that storms do not always travel in the direction of the prevailing wind, a concept which would have great influence in meteorology.